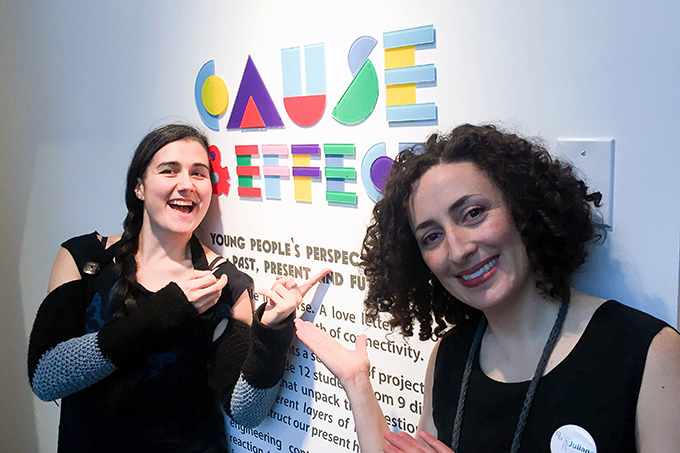 We recently celebrated the opening of our new exhibition, Cause & Effect. 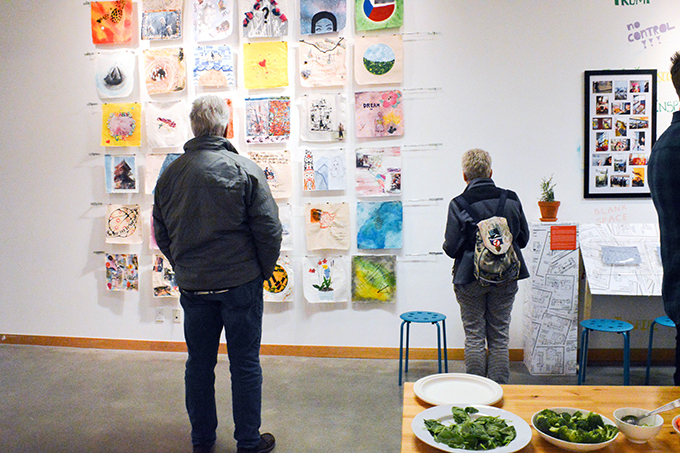 This exhibition presents a selection of projects from Kindergarten to Grade 12 students from 9 different schools across BC that unpack the question, What effects do the different layers of history, place and context that construct our present have on our future? 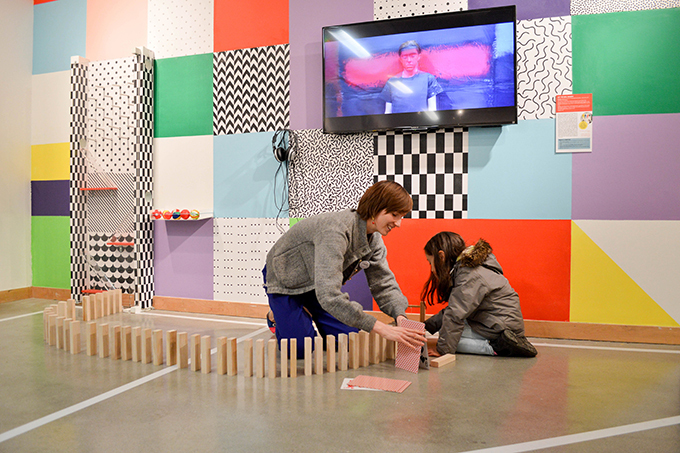 From engineering contraptions that produce a chain reaction to sound mapping, 1,717 students made insightful reflections about place, memory and myth, interpreting narratives from the past and present—and making their own for the future. 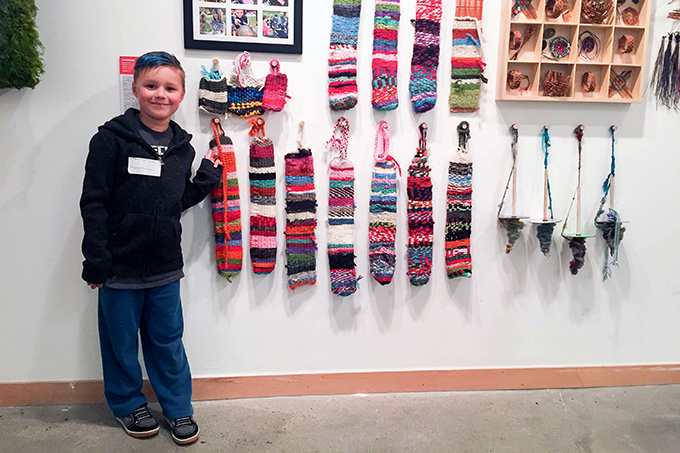 Curator and Gallery Manager Juliana Bedoya welcomed visitors of all ages to the ArtStarts Gallery, and opened up the floor for artists and teachers who had been involved in several of the featured projects. 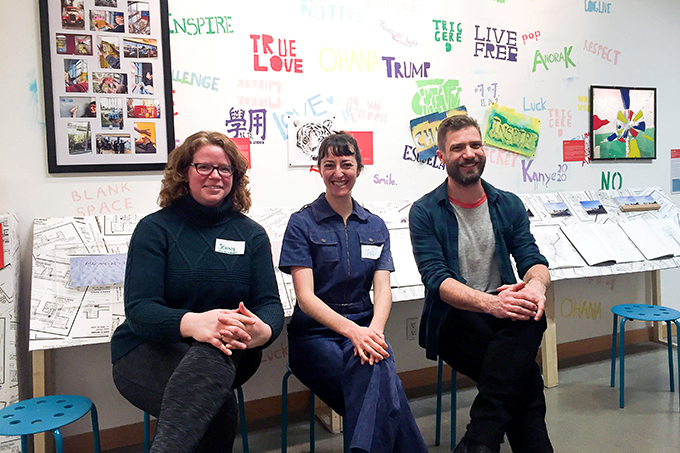 Teacher Jenny Simpson worked on a project called Site Stories with students from New Westminster Secondary and artists Alexandra Spence, Barbara Adler, Julie Hammond and Mark Cunningham. She shared how students were asked to think of something powerful—even controversial—that is taking place in current society. The students had freedom and flexibility to investigate different ideas and mediums of how they wanted to express themselves. They ended up choosing the form of graffiti to represent these ideas. Having such a controversial style brought up conversations on how mediums of art rely their ideas and messages. Artist Mark Cunningham spoke of how they explored different examples of contemporary art to inspire and investigate the students forms, but it also brought up bigger questions as to what art is. 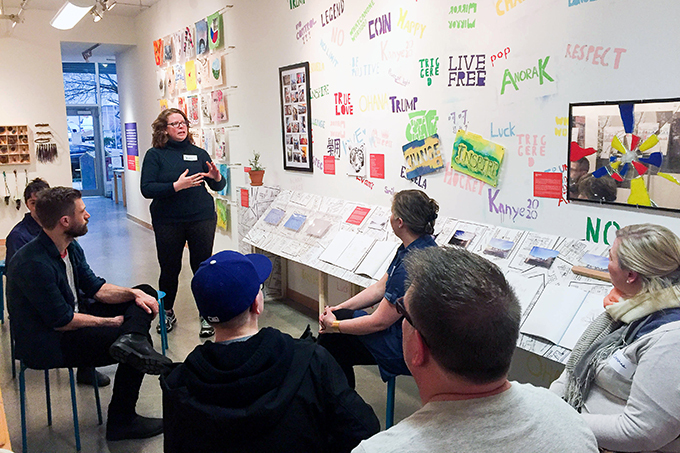 Artist Julie Hammond shared how students learned to perceive their environments in new ways through site walk, map making and sound mapping—observing the school’s landscapes by hearing and identifying all the sounds that fills the space. 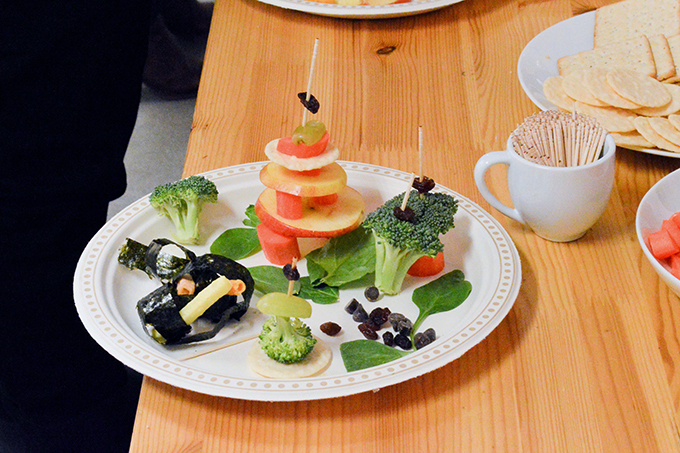 Artist Renée Sala worked on another project, called The Food Forest, with Kindergarten to Grade 5 students at Sidney Elementary on Vancouver Island. She explained how this felting project began outdoors, with students meeting in the garden and sharing their observations of what was growing. Younger grades learned wet felt techniques to create felted objects such as vegetables, flowers and insects. Older grades used needle felting techniques. 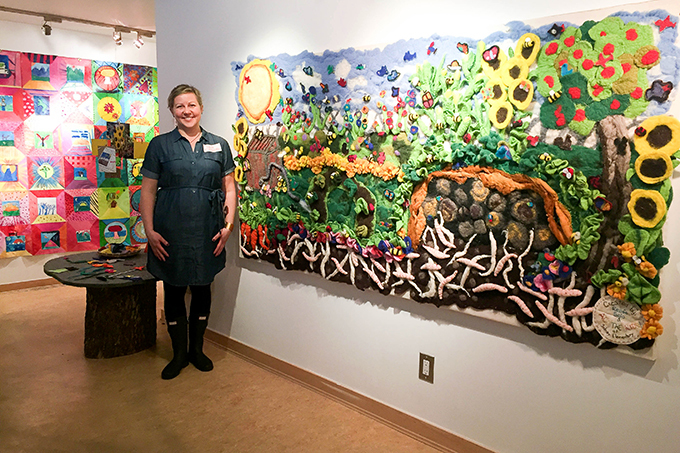 Then Renée pieced all the students' various contributions to build the beautiful garden mural now displayed in the ArtStarts Gallery's mezzanine. Future Markers was a creative project by Grade 6 and 7 students at Lord Strathcona Elementary in Vancouver, undertaken in collaboration with artist Julie Hammond. Julie spoke about the idea of place-making through plaques and what stories become known from them. She challenged students to think how do these stories impact our present and our futures and what personal narratives of their own neighbourhoods would they want to share. 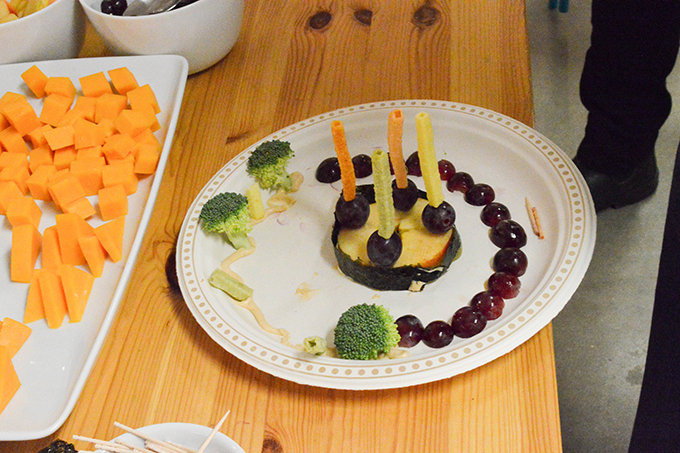 Julie then led everyone in a hands-on activity, where everyone was invited to dream of the future and construct a delicious edible futuristic cityscape. 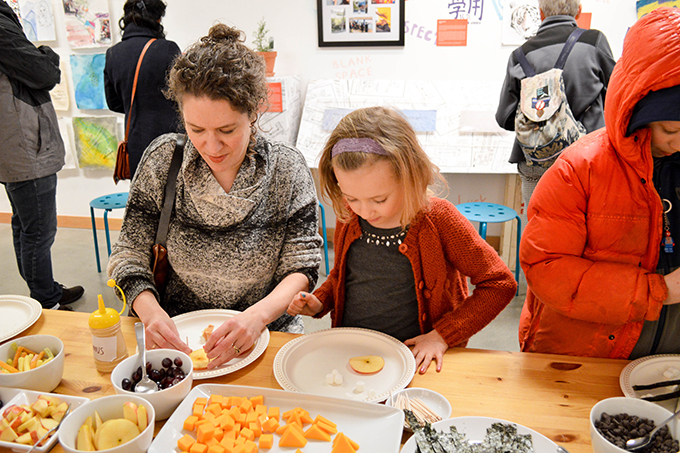 With cut-up pieces of veggies, fruits, cheese, seaweed, mini marshmallows and more goodies, visitors built their own visions of what a future city might look like. Quickly, a landscape of miniature buildings, windmills, parks and gazebos grew up around us. 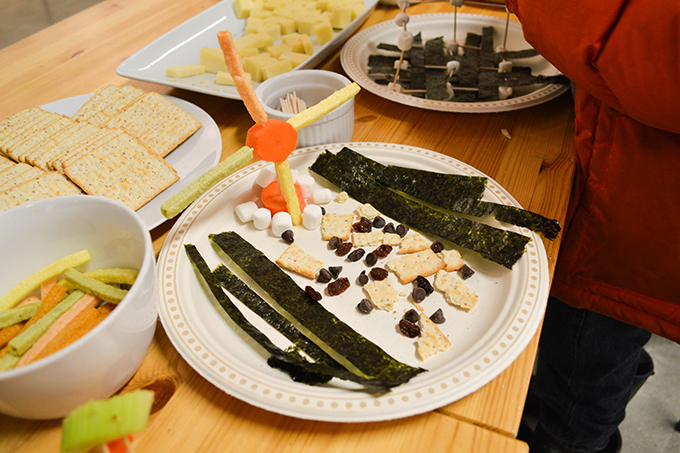 Creations were then enjoyed as delicious snacks! Come explore Cause & Effect for yourself! 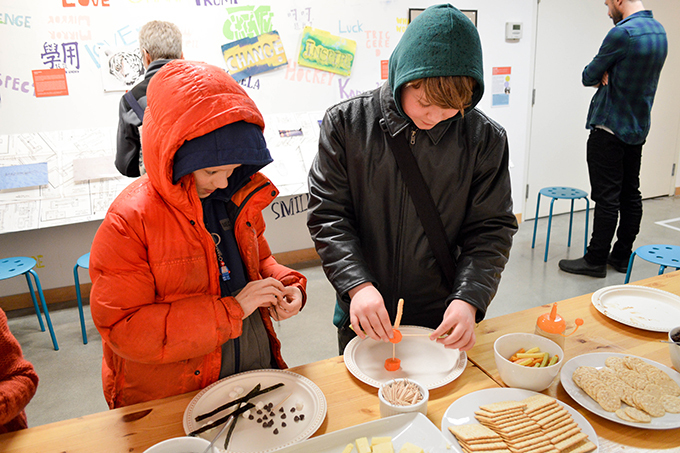 The ArtStarts Gallery is open Wednesday through Saturday. Admission is free and all ages are welcome. What effects are you going to cause today?